As a blind man crosses the street, he fails to notice a truck careening his way. Mikey swoops in just in the nick of time and shoves the old blind man out of the way. The blind man thanks Mikey profusely and, thinking the Turtle to be homeless, offers him a room at the Arrowhead Home for the Blind on West Twenty-Fourth. Pouncing on the opportunity to get the privacy needed to work on the book he’s been dreaming of writing, Mikey accepts and lets the room for a few weeks (much to Leo’s disapproval). Only a few days into his project, Mikey finds it hard to focus. There’s one neighbor in upper floor of his building; a blind man with a seeing-eye dog who is constantly going in and out of the building in the dead of night. Mikey finds his activity suspicious, but tries to write anyway. After some research, he decides to set his story in the mid-nineteenth century, at a bar called McSorley’s Ale House. As soon as he selects the setting, however, he has a change of heart and decides to move the timeframe to the 1950s and the location to a bar called the White Horse Tavern. As Mikey struggles with his creativity, he notices the strange blind man intruding upon the story. Returning to reality, Mikey peeks out his door and sees the blind man leaving at 11:58pm… carrying a book that looks far too ancient to be in Braille. Wondering what a blind man would be doing with a book, Mikey follows him to Madison Square Park. Peeking through the bushes, he sees the blind man reading. Suddenly, the scene changes and the blind man, now dressed in a toga, is lying on the ground with his head on backward. Even stranger, the clock on the nearby Metlife Building appears to be ticking backward. Mikey suddenly awakens in his room at midnight. Peeking out the door, he sees the blind man carrying a book. Wondering what he could be doing with a book, Mikey follows. On the way, he passes the spot where the home of Herman Melville once stood, not far from the Arrowhead Home. Scaling a building that overlooks Madison Square Park, Mikey spots the blind man, now wearing a toga, reading from the ancient tome and hovering in mid air. There’s an earthquake and a humongous worm bursts from the ground. The worm introduces itself as Ouroboros and demands to know who has summoned him. The blind man says he is the prophet Tiresias and he wishes to strike a bargain to remove his curse of immortality. Tiresias has had a vision of an event that will take hundreds of thousands of lives. In exchange for his own death, he will cast a spell that will bind those doomed souls to the White Worm. Ouroboros accepts and Tiresias enters the worm’s mouth. Mikey suddenly wakes up in his room after hearing the strange blind man descend the staircase. Feeling a weird sense of déjà vu, Mikey decides to get to the bottom of things and sneaks into the blind man’s room. He finds a photograph of the blind man with Herman Melville, which should be impossible. Even stranger, he finds the book the blind man was carrying in his dreams: “De Vermis Mysteries” by Ludvig Prinn. Knowing something is very wrong, Mikey goes to warn the other tenants of the Home. Not only does he find each room empty, but he finds that each room hasn’t been occupied for years; he’d been alone in the building the entire time. As he sits on his bed trying to figure things out, Mikey is approached by the blind man. Tiresias reveals that everything Mikey has experienced has been an illusion. The setting then changes to Madison Square Park and Tiresias appears in his true form; a man in a toga with his head on backward. Tiresias explains that part of his curse is to always see where he has been, but never where he’s going. Mikey gets ready to fight, but Tiresias says that after his sacrifice, his curse will be lifted. A beam of energy then paralyzes Mikey and he finds himself back in his room at the Home. Mikey passes out. Shortly afterward, Mikey is woken up by Raph. Don is testing the old abandoned room for carbon monoxide and finds that the place is filled with deadly levels of the stuff. Mikey struggles, trying to relate his story of the sorcerer and the White Worm and how they have to stop him. Leonardo tells Mikey that he’s been hallucinating. While saving the blind man from the truck, he was hit in the head by the fender. Suffering from a concussion, he crawled into the abandoned building on West Twenty-Fourth and has been unconscious for days. If the Turtles hadn’t tracked him down, he would have been killed by carbon monoxide poisoning. As Raph and Don carry the unconscious Mikey out of the building, Leo feels compelled to search an upstairs room. Inside, he finds the skeletal remains of a seeing-eye dog as well as an old book: “De Vermis Mysteriis” by Ludvig Prinn. Leo suddenly finds that he doesn’t know quite what to believe. 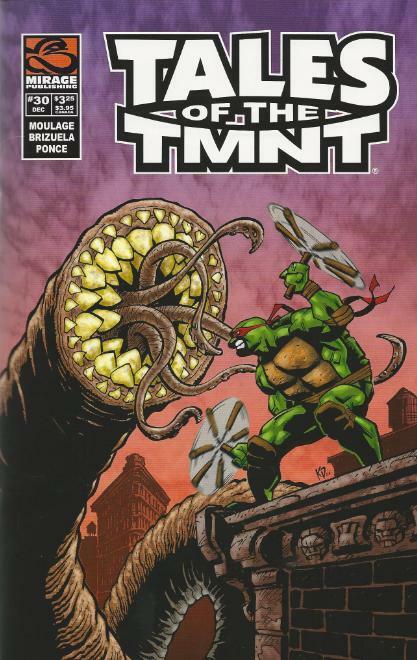 *Chronologically speaking, I would place this story sometime after TMNT (Vol. 1) #21, when the Turtles had returned to New York. *Mikey was first shown taking an interest in writing in TMNT (Vol. 1) #17. 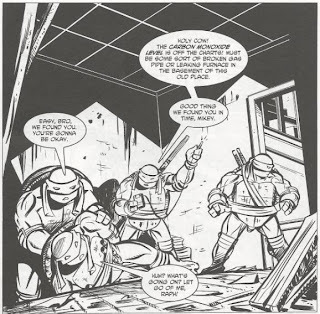 While he was shown pursuing the career aggressively in Image’s TMNT Vol. 3, this marks one of the few times Mikey is shown continuing the craft in Mirage continuity. *Tiresias mentions a vision in which hundreds of thousands die. He may be referring to the apocalyptic future seen in Tales of the TMNT (Vol. 2) #69. 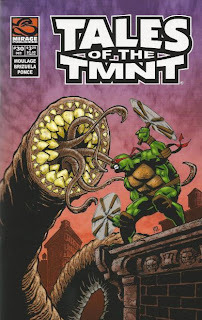 Michelangelo will meet another Lovecraftian deity that predicts the end of the world in Tales of the TMNT #45. *The book “De Vermis Mysteriis” was created by author Robert Bloch as an addition to the Cthulhu Mythos of writer H.P. Lovecraft. *This issue also contained a bonus story, “The Mother of All Anger” by Will Tupper and Jon Landry. Like a lot of people, I discovered H.P. Lovecraft in high school when I was searching for horror literature somewhere in-between the modern masters like Stephen King and Clive Barker, and the gothic authors like Edgar Allen Poe and Bram Stoker. I stumbled upon a “Best of H.P. Lovecraft” paperback from Del Rey (which I still own to this very day despite it being in tatters) and from there I had to read EVERYTHING. And once I devoured Lovecraft’s entire works, I moved onto his Weird Fiction contemporaries, such as Robert E. Howard, August Derleth, Clark Ashton Smith and, as it pertains to this issue of Tales of the TMNT, Robert Bloch and Fritz Leiber. I love me some Lovecraft, is what I’m getting at, and much to my surprise, the Weird Fiction medium actually blends into the universe of the Teenage Mutant Ninja Turtles astonishingly well. Tristan Jones recently penned a fantastic miniseries for IDW, Infestation 2: TMNT, which pitted the Turtles against Lovecraft’s “Black Goat with a Thousand Young”, Shub-Niggurath. And even the cartoons, both old and new, have dabbled in some limited Lovecraftian elements. The Fred Wolf TMNT episode “Splinter No More” by Michael Reaves boasts some neutered Lovecraftian influences, while the 4Kids TMNT episode “The Darkness Within” was very obviously inspired by the Mythos. 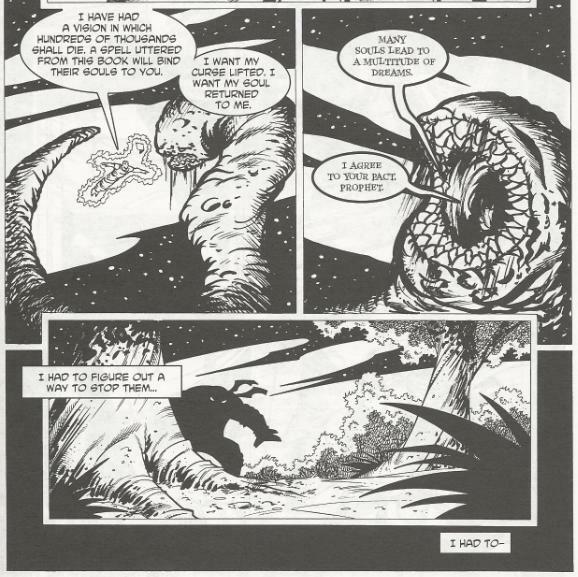 The best Lovecraft-inspired TMNT story, for my money’s worth, is “Circle of Darkness” by Bill Moulage (scripting a concept conceived by Steve Murphy). In reality, its two strongest Cthulhu Mythos influences aren’t drawn from Lovecraft stories at all, but from two of his contemporaries (members of the “Lovecraft Circle”, as it's called, now). “De Vermis Mysteriis” was created by Robert Bloch (youngest member of the Circle) and featured in quite a few of his Mythos stories, most notably in a trilogy he co-wrote with Lovecraft (“The Shambler from the Stars”, “The Haunter of the Dark” and “The Shadow from the Steeple”). The idea of a giant worm lurking below cities and causing earthquakes seems to have been taken from a story by another member of the Circle, Fritz Leiber, called “The Terror from the Depths”. But more than just references and slimy monsters make “Circle of Darkness” feel so authentic. Moulage buckles down and pays excruciating attention to geography and landmarks to draw you into the reality of the story; tying the locations of actual buildings such as the Flatiron with nearby curiosities such as the birthplace of Herman Melville and empty stretches of shadowy parkland such as Madison Square. Even the bars Mikey references for his story-within-the-story are real establishments. The hallucinations and cracking of Michelangelo’s sanity took me back to John Carpenter’s “In the Mouth of Madness” (the finest Lovecraft-inspired film ever made), but Moulage overcomes the temptation to just have the character “go crazy” and call it a day. Instead, Mike’s insanity, the things he sees, the locations he notices all weave together into a coherent plot once you take the time to unravel them. The "twist ending", that the building was empty the entire time, reminded me a bit of an old horror flick called "The Sentinel" (albeit that the was the mid-movie twist). Obviously, Tiresias had been using that building on West Twenty-Fourth to sacrifice souls for decades (at least going back to the 1890s, as Herman Melville was shown to have lived near the building) and Mike was intended to be the final sacrifice that would free him from his curse. I love the reason why he has to pretend to be a blind man (because his head is on backwards), which felt like the sort of “shock” ending you’d get in the last sentence of a Lovecraft tale. 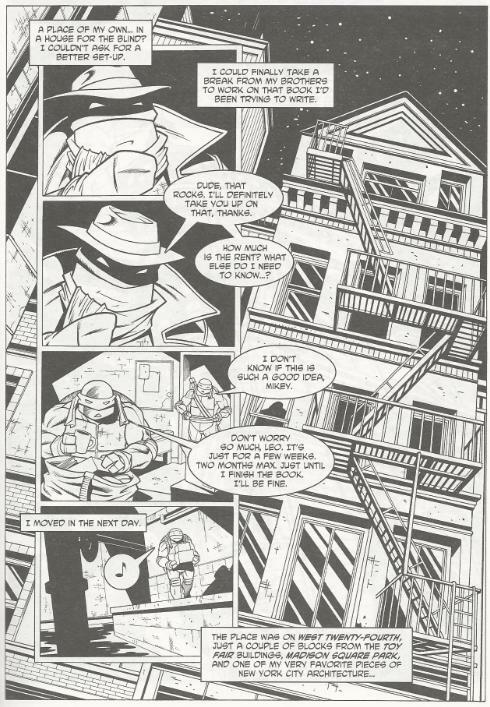 From a TMNT perspective, Moulage dredges up Mikey’s love of writing, which is one of his traits the Mirage crew always neglected for reasons I could never understand. It was a good choice, as Lovecrafts protagonists, when they weren’t wealthy, upper class scholars, were typically struggling authors (the man was a visionary, but his protagonists were almost all completely interchangeable). The approach accommodates a noir-style inner monologue that would have felt far more awkward without the “distracted author” trappings provided by Mikey. Dario Brizuela turns in more great pencils, which is the usual for him. 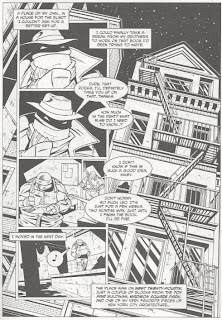 He captures the authenticity of the architecture and location shout-outs in the script, with a particularly nice splash page of Leo perched atop the Flatiron Building. The story ends on a delightfully eerie note, as Brizuela’s pencil rendering of the building on West Twenty-Fourth gives way to an actual photograph (taken by Murphy); a subtle reminder that “the place is real”. I’ve only been to Manhattan twice, but during each visit I must have taken ten dozen photos of just buildings (all of which were lost when my old hard drive crashed). I love the congested mix of old turn of the century buildings with modern constructs, though I love the blocks comprised of nothing but the crumbling old places even more (not that I’d be stupid enough to visit those neighborhoods after dark, mind you). New York: An awesome place to visit, but I’d never want to live there. “Circle of Darkness” is a favorite of mine, partly because I’m biased in my tastes, but also because it’s just a well-crafted story. If this had been written in prose and all TMNT characters removed, it would have been just as effective a horror story, which I think says volumes about its quality.